The UK annexed Southern Rhodesia from the South Africa Company in 1923. A 1961 constitution was formulated to keep whites in power. In 1965 the government unilaterally declared its independence, but the UK did not recognize the act and demanded voting rights for the black African majority in the country (then called Rhodesia). UN sanctions and a guerrilla uprising finally led to free elections in 1979 and independence (as Zimbabwe) in 1980. Robert MUGABE, the nation's first prime minister, has been the country's only ruler (as president since 1987) and has dominated the country's political system since independence. The government of Zimbabwe faces a wide variety of difficult economic problems as it struggles to consolidate earlier moves to develop a market-oriented economy. Its involvement in the war in the Democratic Republic of the Congo, for example, has already drained hundreds of millions of dollars from the economy. Badly needed support from the IMF suffers delays in part because of the country's failure to meet budgetary goals. Inflation rose from an annual rate of 32% in 1998 to 59% in 1999 and 60% in 2000. The economy is being steadily weakened by excessive government deficits and AIDS; Zimbabwe has the highest rate of infection in the world. Per capita GDP, which is twice the average of the poorer sub-Saharan nations, will increase little if any in the near-term, and Zimbabwe will suffer continued frustrations in developing its agricultural and mineral resources. The best estate Zimbabwe coffees are prized for their balance in the cup ...which might sound like it is mild, but that is not the case. Balanced coffees are a "complete cup." They have all the desirable qualities. A really good Zimbabwe has moderate acidity, rich flavors, good body and aftertaste. 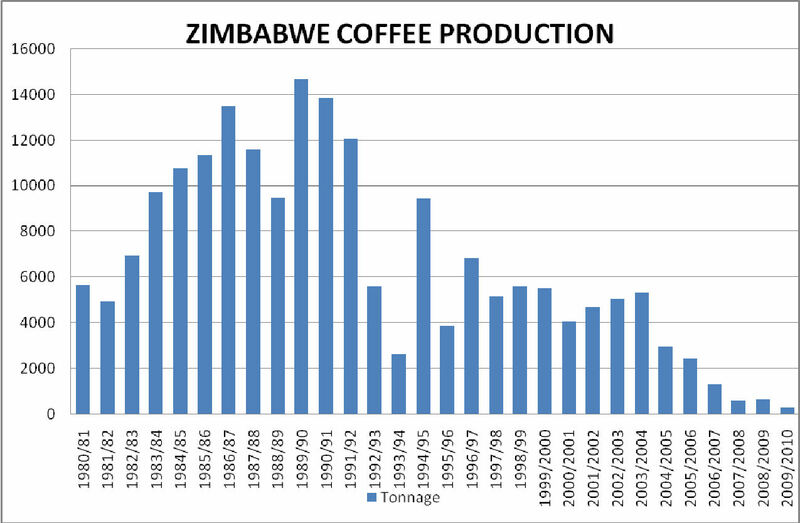 The problem is, there are many coffee lots sold as generic Zimbabwe which theoretically can be good but in reality are often not. (part of this is the difficulty with shipping coffee from this land-locked nation. Coffee steaming in 100 degree weather in a metal shipping container for 6 weeks while waiting for pickup is not good for cup quality!) So simply being a Zimbabwe coffee is by no means enough. That said, there are the uncertain political environment affecting agriculture and commerce now, and so good coffee from Zimbabwe is hard to come by. But we found this Salimba sample, graded for bean size at AA+, and with all the good character expected of this origin. Theb aroma is both sweet and sharp, with a hint of the East African "wild" note in the coffee, in this case it is like an aromatic bark (wood that is, not canine). It develops excellent roast flavors at Full City, and has that smack of East African wildness, just a bit hidey, in the aftertaste. Alternating between slightly sweet-caramelly and bittersweet pungency, your choice of roast between City and Full City will accent different characters in this coffee. The numbers on the Salimba are a bit down from last years, but as this cup cools the character really emerges. If you chose a light roast interpretation, let the coffee rest a little longer before brewing - 24 hours at least. You can also make interesting straight espresso from the Salimba, although I am sure Mr. Illy will turn in his grave at the suggestion.